In the introduction to a photo essay on the Iranian election featuring images by Tehran native Newsha Tavakolian, TIME Middle East Bureau Chief Aryn Baker offers up a bit of incomplete - if not implicitly revisionist - history regarding Iran's last presidential election in 2009. Many salient facts about that election have since been replaced by the mere "social fact" of a fraudulent vote. Polling station hours were extended late into the evening of June 14th, and, unlike the elections of 2009, when the results were announced almost immediately, the count took an agonizing 24 hours. First, in an apparent effort to bestow added legitimacy to Hassan Rouhani's victory as compared to Ahmadinejad's reelection, what Baker omits is that, just like this year, voting hours were similarly extended four years ago to accommodate the large turnout and lingering lines of voters at polling stations around that country. Originally set to close at 6pm on Friday June 12, 2009 in Iran, polling stations were eventually kept open until midnight (and some until 2am, according to official reports). In 2009, Iran's young people were trying to reform the system in their enthusiastic support of presidential candidates Mir-Hossein Mousavi and Mehdi Karroubi. But when incumbent Ahmadinejad was declared the victor with more than 60% of the vote, even before the polls closed, many gave up on democracy. How this supposed declaration managed to move from "almost immediately" to "even before the polls closed" within TIME's own recollection speaks to the tendency of mainstream writers and editors to offer bromides more often than checking facts. While reports that Ahmadinejad had secured over 60% of the vote began trickling out in the Iranian media in the early hours of Saturday morning (when vote totals for only 5 million votes were reported and again, later, when 61% of the vote - or roughly 21 million ballots - had supposedly been tabulated), what is often left out of the story is that - even before the polls closed - it was reformist candidate and the main presidential challenger, Mir Hossein Mousavi, who declared himself the winner, setting off the avalanche of accusations that later followed and essentially inciting protests on the streets. Neither the Ahmadinejad nor the Iranian government itself made such a premature pronouncement. Every mainstream outlet acknowledged and reported this at the time, though one would be hard-pressed to find any mention of it since. 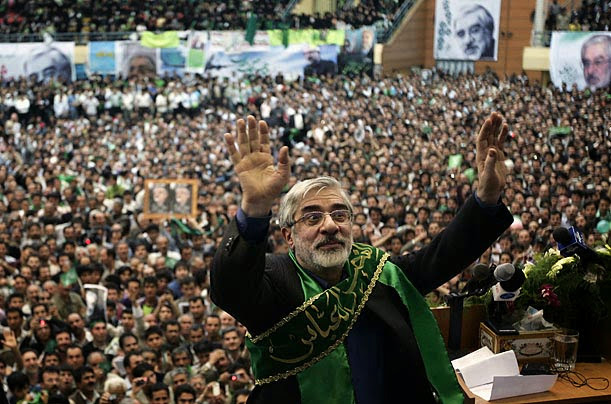 As The Washington Post reported that day, "Friday, on election night, Mousavi claimed victory even before the polls closed," while Reuters wrote that "Mousavi had earlier tried to pre-empt official announcements by calling a news conference at which he alleged there had been irregularities, including a shortage of ballot papers." “I am the absolute winner of the election by a very large margin,” the New York Times quoted Mousavi as saying during a news conference with reporters just after 11 p.m. Friday night, while many polling stations around the country were still open. “It is our duty to defend people’s votes. There is no turning back,” he added. An Associated Press report noted, "Even before the first vote counts were released, Mousavi held a news conference to declare himself 'definitely the winner' based on 'all indications from all over Iran.' But he gave nothing more to back up his claim and alleged widespread voting irregularities without giving specifics — suggesting he was ready to challenge the final results." Meanwhile, AFP documented, "Mousavi had earlier claimed for himself an overwhelming victory" and quoted the candidate and former Prime Minister as declaring, "In line with the information we have received, I am the winner of this election by a substantial margin." The report added, "Only minutes earlier, close Mousavi aide Ali Akbar Mohatshemi-Pour told AFP his candidate had won 65 percent of the vote." Similarly, Al Jazeera reported, "Mousavi had claimed victory just moments after polls closed on Friday," and issued a version of the above quotes: "In line with the information we have received, I am the winner of this election by a substantial margin," he said. "We expect to celebrate with [the] people soon." So who "announced" the results of the poll "almost immediately" back in 2009? No one. Who declared himself the winner of the election "even before the polls closed"? Mousavi himself, not the incumbent or the Interior Ministry. An hour after Mr. Moussavi declared victory, the state news agency reported that Mr. Ahmadinejad had won the election with 69 percent and that Mr. Moussavi had 28 percent. As the election commission announced new totals early Saturday morning, the numbers changed slightly, but the wide lead by Mr. Ahmadinejad did not. The election commission said early Saturday morning that, with 77 percent of the votes counted, Mr. Ahmadinejad had won 65 percent and Mr. Moussavi had 32 percent, Reuters reported. Then at 8 a.m. Saturday, Iranian state media reported that Mr. Ahmadinejad had about 18 million votes and that Mr. Moussavi had 9 million. The other two candidates, Mehdi Karroubi and Mohsen Rezai, each won about 250,000 votes, the state media reported. It was only after roughly 80% of the vote had been tabulated that was Ahmadinejad officially announced as the winner by the Interior Ministry. Claims abounded after the fact that these results were announced "too quickly" by the Interior Ministry to be considered legitimate, with critics shocked and skeptical that so many millions of votes could be "counted" so fast. But the Interior Ministry's job was never to count votes; rather, vote counts were conducted at each individual voting station by election officials and candidates' observers. The results from the ballot boxes were signed off on by all present and forms with the totals delivered to the Interior Ministry. Copies of these forms (Form 22) were also given to the observers themselves. This information was also immediately transmitted electronically to provincial capitals, where candidates' observers were also present. Once vote totals from the entire district were combined, these totals were then transmitted electronically to the ministry in Tehran (signed originals were also delivered physically later). As analyst Eric Brill has pointed out in a comprehensive examination of that disputed election, "To expedite the national vote tabulation in the 2009 election, Form 22 information was also transmitted directly from each polling station to the Interior Ministry. Observers are present when any electronic transmission occurs." That the Ministry could have started announcing vote totals only hours after the polls closed (especially those that hadn't needed to stay open late to accommodate crowds) is therefore quite unremarkable. To date, not one of the Mousavi campaign's 40,676 officially registered poll observers has reported that they were denied access to the vote counts, let alone refused or were prevented from signing off on Form 22 at their polling station. This year, Iran watchers claimed that the slower announcements proved that the government was actually "counting the votes" this time around, as opposed to four years ago. But others noted that the totals were already known to the Interior Ministry, but simply released more gradually so as to avoid the tumult of 2009. Hassan Rouhani himself arrived at the Interior Ministry in the early hours of Saturday morning, followed by some of the other candidates, presumably to coordinate how best to announce the final result of the poll. The authorities had initially announced they would begin to reveal counts just after 2am local time on Saturday, but the first figures did not come through until at least four hours later. This was in marked contrast to the previous vote in 2009, which many believed was rigged, when final results were announced in matter of few hours. What is also ignored is that this year marked the first time the elections were overseen by a new, semi-independent election committee, so as to take sole responsibility away from the Interior Ministry. This too could have made the process either take a bit longer than last time, or (more likely) changed the way the vote count was announced publicly. Also of note is the fact that, prior to the 2009 election, Mousavi's backers - namely former president Akbar Hashemi Rafsanjani and his family - laid the groundwork for the allegations they would later make. Barbara Slavin, writing in The Washington Times on June 12, 2009, reported that, days before the vote, Rafsanjani wrote to Ayatollah Khamenei warning of "violence if Mr. Ahmadinejad wins." "Even if I continue to tolerate this situation, there is no doubt that some people, parties and factions will not tolerate this situation," Rafsanjani's letter read, in what Slavin called "an oblique reference to Ahmadinejad opponents taking matters into their own hands." Furthermore, early on the day of the vote - while polls were open - Rafsanjani's wife Effat Marashi, after casting her own ballot, reportedly claimed that "if there is no cheating, Mousavi will become president," and insisted, "If people see that [the government] has cheated, they should protest in the streets." This time, however, for obvious reasons, there was an explicit appeal for patience and calm by all the candidates' campaigns. The day of the June 2013 vote, AFP reported, "Representatives of all six remaining hopefuls approved by the conservative-dominated body that vets candidates for public office urged their supporters to remain calm until the official results are known." "We ask people not to pay attention to rumours of victory parades being organised and to avoid gathering before the official results" are announced by the Interior Ministry, their joint statement said. Quite a difference from four years ago. This may seem like relevant information when comparing 2009 with 2013. But, as always, regardless of the facts and in service to the widely-accepted narrative, TIME marches on. "The last time Iran held presidential elections, in 2009, the re-election of President Mahmoud Ahmadinejad was announced while people were still lined up to vote, fueling allegations of fraud that sparked large-scale demonstrations," she wrote. Clearly, as evidenced above, this is false.